This blog is a bit different: not a review of a recent publication, but rather a teaching point for my junior trainees (and maybe some seniors). The question is this: when you have preterm infant with typical HMD and respiratory distress in the first few hours of life to whom you give surfactant; what happens to pulmonary compliance? Try not to look at the answer until your knee has jerked and you have made your choice. The correct answer is not it increases but ‘it depends’ (that is often the correct answer) but on what? Static compliance is measured when there is no gas flow (hence static) and to produce the complete pressure volume loop the applied pressure should be taken down to zero. This gives the typical curve with its hysteresis. Dynamic compliance is measured during tidal breathing (or tidal ventilation) so delays in gas movement as a result of airway (or endotracheal tube) resistance are important, and the curves look quite different. Now if static compliance is improved: and you make no changes on the ventilator, that is you have the same PEEP, then end-expiratory lung volume is higher. 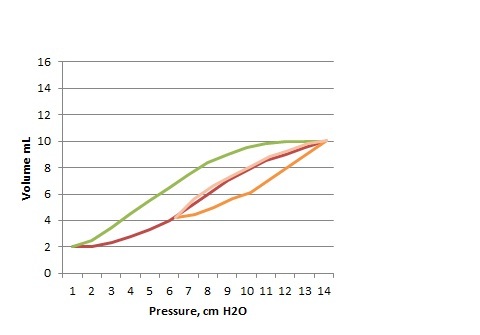 BEFORE, An applied pressure increasing from 0 to 13 cmH2O gives a volume of 8 mL. But during tidal ventilation what we see and measure are DYNAMIC loops, such as these before and after loops below. 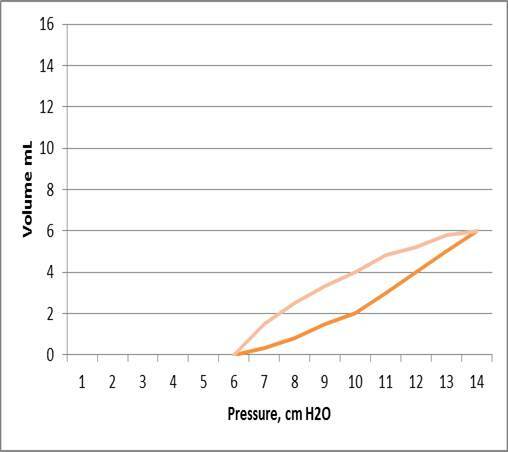 If you look at the pressure volume loops on the front of your new fancy ventilator, that cost an extra 10,000 dollars for you to have pressure volume loops displayed, they will look like this, that is, there is no difference between pre and post surfactant loops. What you will also always see is that the end-expiratory lung volume is zero. Neonatal ventilator graphics reset to zero at the end of each breath, this has to be so, because of ETT leaks, if the graphics did not reset they would soon disappear off the screen. So now we see that the Dynamic compliance CLdyn is 6 mL/8 cmH2O both before and after surfactant. This means that you cannot use the pulmonary graphics to determine whether the PEEP is optimal or if the baby is ready to wean. 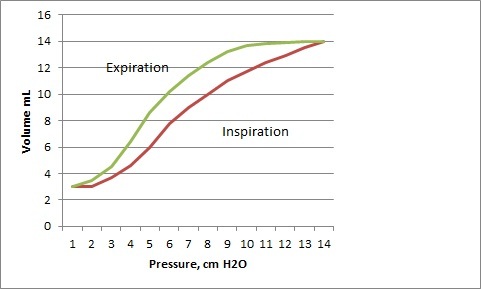 A better way to determine whether the surfactant has had an effect is simply to watch the FiO2; as the figure in Ben Stenson’s article referenced above shows, the decrease in FiO2 occurs at the same time as the improvement in Static Compliance. So when the FiO2 falls, reduce the PEEP: you will immediately afterward see the pip fall (on volume ventilation) or the volume increase (on pressure ventilation), and now you will be able to note the improvement in compliance. What Is the Best Positive End Expiratory Pressure (PEEP) in Ventilated Low Birth Weight Infants? PAS-meeting abstracts 2009, #3858.115). Please don’t tell me that this is ‘below physiologic PEEP’ as many residents have told me in the past. There is no such thing as physiologic PEEP. Positive pressure ventilation is not physiologic. 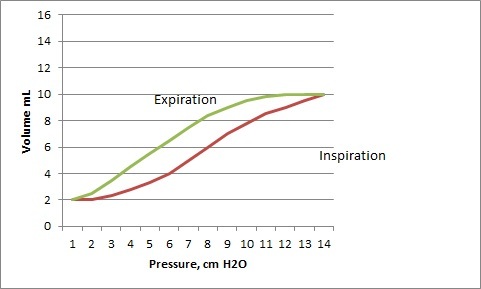 The physiologic pressure in the airways at the end of expiration is zero. If it were not so, it would not be the end of expiration. So the actual optimal PEEP would be what allows airways and airspaces to stay patent, and at the same time avoids overdistension. It is unlikely that there is one pressure which will suit all babies, but PEEP which is very low can be optimal for some babies, you can tell if you have gone too low when the FiO2 starts to increase again. 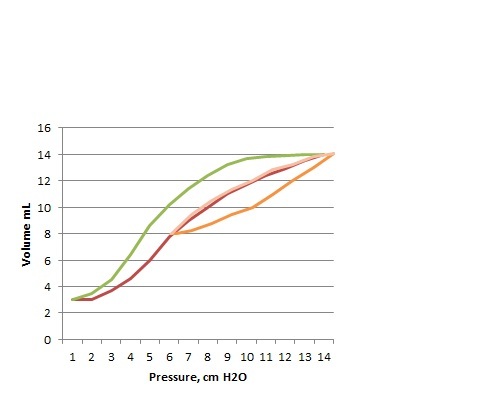 So when you give surfactant, don’t expect a change in the pressure volume loops, expect the FiO2 to decrease, when this occurs decrease the PEEP, and if the baby stays in 21% you can decrease to 3 cmH2O. Then get the baby extubated! This entry was posted in Neonatal Research and tagged lung compliance, pulmonary physiology, surfactant treatment. Bookmark the permalink. Thank you sir, extremely helpful article, we have been reducing the PIP to reduce air leak. Sir, should we not reduce the PIP? I always reduced both FIO2 parallel with pip to reduce mismatch. PEEP was last to reduce.Would really appreciate Ur suggestion. I don’t think your approach is wrong, if you reduce pip you will indeed reduce the end-inspiratory lung volume, which is probably most damaging to the lung. But you will of course reduce tidal volume, and risk under-ventilating the baby, while still having a lung which is overdistended at end-expiration. I think the best approach is to have the baby on volume ventilation at a tidal volume of probably about 5 mL/kg, and reduce the PEEP according to the FiO2. THat way the pip will reduce automatically adn the overall minute ventilation will not be much affected. If you don’t have volume ventilation you can achieve a similar result by watching the tidal voluem adn reducing the pip to achieve the Vt that you want. And if you have older ventilators that don’t measure tidal volume then watching the chest move and trying to limit the pip is a good approach.